Observers under dark skies, far from the bright city lights, can marvel at the splendor of the Milky Way, arching in an imposing band across the sky. Zooming in towards the center of our galaxy, about 25000 light years away, you can see that it is composed of myriads of stars. And in related news there is actually a debate that is going on amongst astronomers. Some are saying black holes do not exist. Most would disagree with that statement. In this video they show an insane simulation based on their astronomical calculations and a lot of data from some of the largest space telescopes in the world. Which side are you on in the black hole discussion? This is a pretty impressive sight, but much is hidden from view by interstellar dust, and astronomers need to look using a different wavelength, the infrared, that can penetrate the dust clouds. With large telescopes, astronomers can then see in detail the swarm of stars circling the supermassive black hole, in the same way that the Earth orbits the Sun. 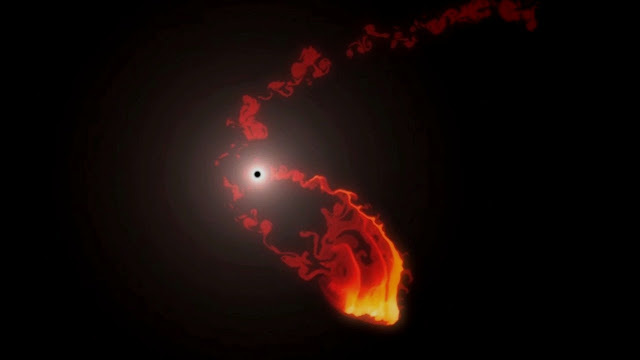 The Galactic Center harbors the closest supermassive black hole known, and the one that is also the largest in terms of its angular diameter on the sky, making it the best choice for a detailed study of black holes.This black hole’s mass is a hefty four million times that of the Sun, earning it the title of supermassive black hole. Although it is huge, this black hole is currently supplied with little material and is not shining brightly. But this is about to change.